This is an original 20th Century Fox Video VHS release of the original unaltered Star Wars. From what I gather, this was released in September 1982 in an oversized cardboard "drawer" case. So I think this would make it the third VHS release of this film from this year. 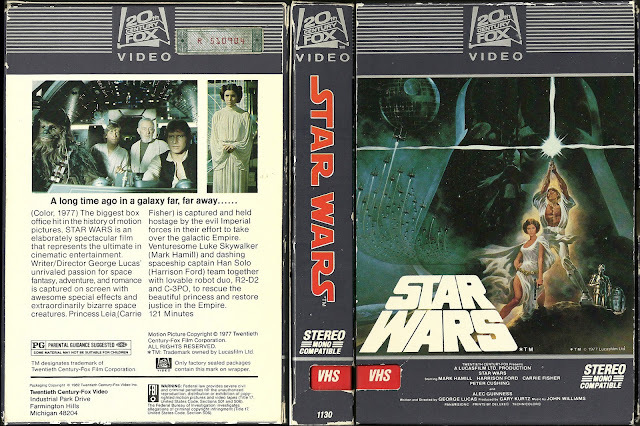 The first two were "Video Rental Library" versions specifically intended for Libraries, one in a black clamshell case (the "Holy Grail" of Star Wars VHS tapes), and the second is in this same exact format here, except it has the words "Video Rental Library" displayed on the front, spine and back with some subtle differences on the back. This one here would be the third official VHS release and the first release available for purchase and along with the other two previous versions released this same year, is one of the rarest and most sought after by collectors. I've had my eye out for one of these for a long time and have bid and lost on many eBay auctions this past year. Usually they go for anywhere from around $50 to over a hundred, depending on the condition and if there are any bidders out there looking for this at that particular time. Funny thing though is that about a week ago I was casually browsing eBay for some VHS tapes in the sci-fi section (not even looking for this in particular) and this was at the top of the list with only 2 days left and a starting bid of only $10, with no bids at that point. I thought "what the hell?". I've certainly bid on and lost on plenty of these in the past to know that I would more than likely walk away the loser on this one again, but it never hurts to try. To my astonishment, no other bids were placed and when the auction was over, I had won it with my $10 starting bid and I couldn't be happier. The condition of this VHS is pretty decent (the main issues being edge wear), but for the most part looks great. I guess it just goes to show you that sometimes it just pays to be patient. Cool rG, I have the unaltered laserdiscs of the trilogy, and always watch those rather than the dvds. So far I've resisted the urge to buy the blu rays! A hero never dies: It's funny you mention that. 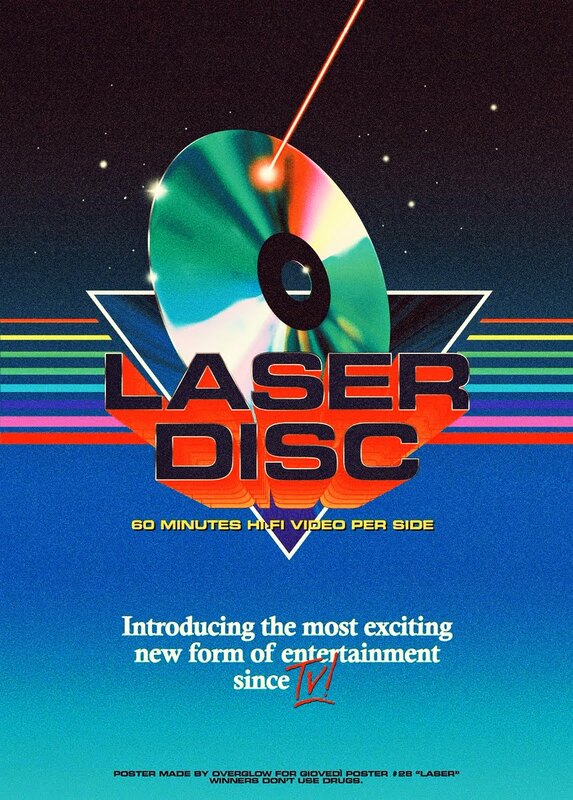 I had a friend many years ago who had those unaltered laserdiscs and I would borrow her player and laserdiscs so I could watch them in there original format and in widescreen. Good memories. I still haven't purchased the Blu-rays yet either. If I do, it might be more for the insane amount of special features than anything. Just picked this up at Goodwill for .50 cents. Pretty happy with the trip! What!? That's crazy and insanely awesome! I would have been a very happy camper after that trip for sure. Great find! Hey, I just picked this up for 50 cents and salvation army! I just found one too at the thrift store for .50.. thanks!! I just got a copy 1.00 at the thrift, just watched it. Thanks for the info. I got a copy that looks like the one you have. My number is R 516437. That would be a awesome website if people registered their copy on a public site. If anyone stole it the new buyer would know if it was stolen. For $1 ?!?! Dude you lucked out!! I agree, that's a great idea. There should be a site where we could register our copies. I'm down! I also just picked up the the first three episodes. The first 3 as in the first three made. not the prequels. Found them at Goodwill. I have been looking for the first released, as I understand it that would be 1982?. Mine look the same as the one you show. Name of the original movie is STAR WARS [PERIOD. not New Hope}, and the artwork is the same as far as I can see, in the fine print it shows a 1992 copyright though. So My copies must have been a re-release after the first remastering of the Laser copies. as I understand the progression from reading on line. Does that sound right?